My first crafting love has always, without a doubt, been scrapbooking. From the second I walked into my neighborhood’s tiny little scrapbook store to make my boyfriend (now husband) a gift, I was hooked. Stickers and textured paper and colored stamps and punches…I love them all! I love the forgiveness and patience of paper crafting, too. There’s no rush to pick the perfect spot for a framed picture on the page, you can test fit without committing to a layout for a card, and you can change your mind countless times. It’s basically the opposite of cake decorating. Ha! Sadly, I just do not have the time, space, and budget to scrapbook the way I used to. So I try to get my fix in where I can. These gift tags scratch the itch, I tell ya. They are so easy you could make stacks of them during just one naptime. And they really add a personal touch to the gift. Also, they’re very inexpensive; always a consideration for my family. I found everything you see at my favorite craft store, Jo-Ann. I can't believe they don't know me by name yet. 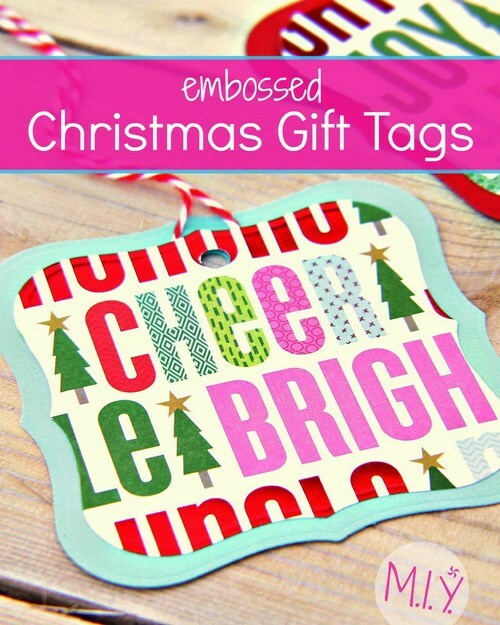 If you don't have an embossing machine, it is possible to simply use a stencil to trace and scissors to cut out the tags. They would still look really nice and be totally personal. The embossing is just a nice finishing touch. So I’ll start out with the Short and Sweet instructions for a brief overview. Below that is everything you need to know to make these in All the Details. 1. Cut and emboss the top layer of the tags using the second largest die cut in the set. 2. Cut and emboss the bottom layer of the tags using the largest die cut in the set. 3. Punch a hole through both layers for each tag. 4. Secure some twine or string to the bottom layer of each tag, just underneath the hole. 5. Glue the top layer paper on top. 6. Tie or tape on to a beautifully wrapped gift and spread the Christmas joy! 1. Take your printed scrapbook paper and lay the second largest die cut on it to plan out how many rows and columns you can get per sheet. With this size die cut I got 3 rows of 3. 2. To be able to send the paper and die cut through the embosser, you will need to cut the scrapbook paper, like so. 5. And use the crank to roll it on through. 6. Now make the “sandwich” for the embossing step. 8. And roll it on through. 9. So that’s the top layer of each tag. I am totally in love with this scrapbook paper. I could look at it forever. 10. You follow almost exactly the same steps to make each bottom layer piece, save for the fact that you use the largest die cut in the set. This also means you will only get 2 rows of 2 die cuts per solid colored cardstock paper. 11. Roll it through to cut it. 12. And roll it through to emboss it. 13. Ooooh, I’m getting excited now! 14. Next up is the fun part- assembly! Hold the two layers together and punch a hole about ¾ - 1inch from the top edge of the tag. 15. Cut the twine so that it is long enough to tie to a ribbon, somewhere around 11 inches. 16. Brush some super glue onto the bottom layer paper underneath the hole you punched and set the twine on top of it. If you like to live dangerously and you have no qualms about gluing your finger to the paper, push down to secure it. 17. Using the craft bond glue stick, apply a thick and even coat of glue to the back side of the top layer. Make sure to get around the hole really well. 18. Carefully place the two layers of paper together, lining up the holes. 19. I like to flip them over and press down really well from the back side. 20. Keep going until you have an awesomely beautiful stack of custom gift cards. 21. Tie or tape them to your wrapped gift and give them to your favorite people! I would love to see your homemade gift tags! If you make some, please post to the Flickr group! Happy crafting and gifting, friends! I hope you have a beautiful holiday season! And whatever you make, make it yours!